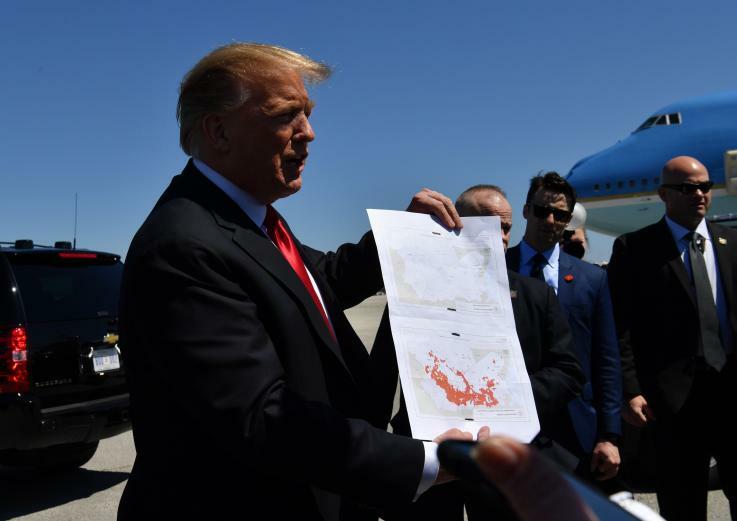 22 Mar 2019 – President Donald Trump has repeatedly declared victory over the Islamic State militant group (ISIS) throughout his term, even as embattled jihadis continued to put up resistance to U.S.-backed forces. The president made a similar announcement Wednesday during a visit to a tank factory in Lima, Ohio. 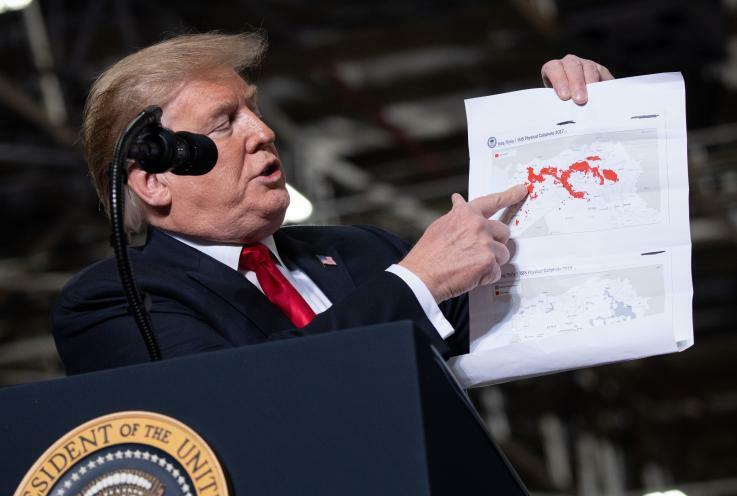 There, too, he showed off a map, except this one compared the “physical caliphate” between 2017—the year Trump took office—and this year, which continued to show large gray zones of “residual ISIS presence” absent from Friday’s map. Trump inherited Obama’s battle against ISIS at the peak of its intensity. The Republican leader took the reigns of Operation Inherent Resolve just as allied Iraqi and Syrian forces were approaching the major jihadi strongholds of Mosul and Raqqa, introducing a deadly urban phase of the fight that saw a massive uptick in casualties. ISIS lost control of its largest city in Iraq in July 2017, and its de facto capital in Syria in October 2017. The following month, the Syrian government—which waged a separate campaign backed by Iran and Russia against ISIS and other, once-U.S.-backed rebels—declared victory over ISIS. A month after that, the Iraqi government made its own victory speech. Even Russian President Vladimir Putin claimed that he and his allies “defeated the most battle-ready grouping of international terrorists” that same December, more than a year ago. As the U.S.-backed Iraqi military and Iran-backed militias supporting them consolidated their gains in early 2018, the conflict in Syria saw renewed fighting between the U.S.-backed Kurds and fellow U.S. ally Turkey, which branded some of them terrorists due to alleged thinks to a separatist insurgency at home. The Syrian Democratic Forces, a mostly Kurdish militia operating with the U.S.-led coalition’s support, continued to battle ISIS, while at the same time facing off with Turkish troops and allied Islamist rebels formerly supported by U.S. as the separate pro-Syrian government campaign tackled insurgents and jihadis alike. 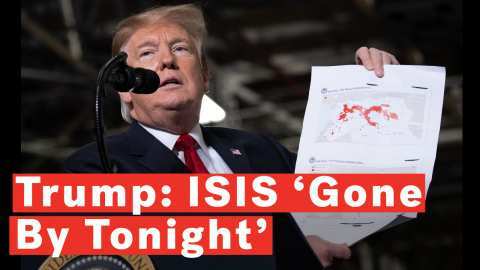 He told a press a September 2018 press conference in New York that “we have defeated ISIS, essentially, very short while ago in the Middle East.” The following month, told the Associated Press “we’ve defeated ISIS, ISIS is defeated in all of the areas that we fought ISIS, and that would have never happened under President Obama.” Trump was soon joined by Turkish President Recep Tayyip Erdoğan, who proclaimed “there is no ISIS in Syria” during a speech in November. The real coup came in December. Trump once again proclaimed that he had “defeated ISIS in Syria” and, for the second time, called for a withdrawal from the country as battling the jihadis was his “only reason for being there.” Those Twitter remarks reportedly came as a shock to his top generals—like Secretary James Mattis, who resigned days later—and foreign policy officials, prompting Secretary of State Mike Pompeo and National Security Adviser John Bolton to quickly set out on Middle East tours to reassure regional allies. The president signaled that his premonition came true at the beginning of this month, telling troops at Joint Base Elmendorf-Richardson in Anchorage, Alaska, that “you kept hearing it was 90 percent, 92 percent,” but now “100 percent” of the so-called caliphate had been destroyed. 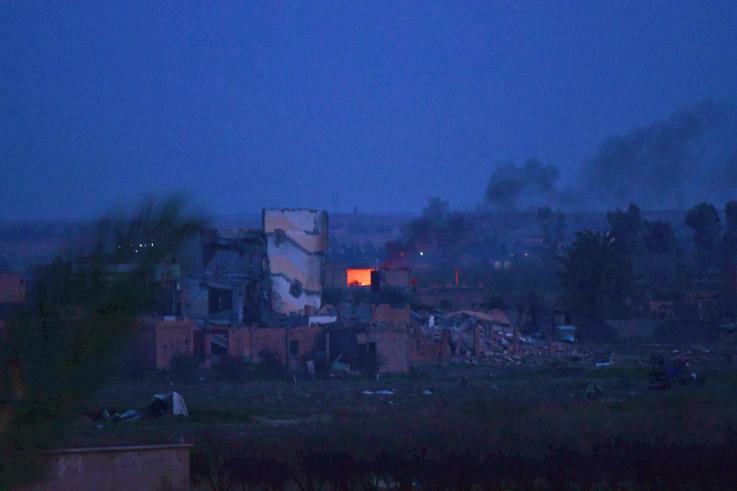 The statement came the same day that Syrian Democratic Forces commander Mazloum Kobani announced his fighters had just begun the “operation to clear the last remaining pocket of ISIS” in the village of Baghouz. The Syrian Democratic Forces have since entered Baghouz and have begun facing off with what may very well be the last of the caliphate. As of Friday, however, Syrian Democratic Forces spokesperson Mustafa Bali maintained that “heavy fighting continues” in the final push against ISIS.